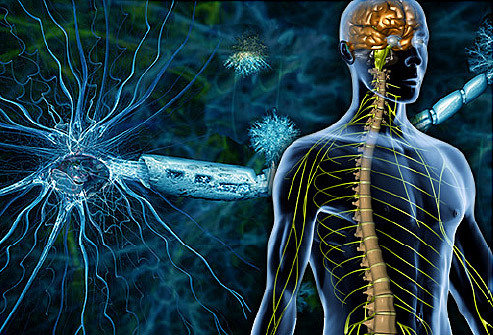 ​Multiple sclerosis or MS is considered a progressive, degenerative disease of the nervous system that is quite common, especially in the northern, colder latitudes such as in Canada and the Northern USA and Northern Europe. Women are affected more than men, and many who are affected are young adults. Those affected are often very intelligent people who have a strong mental intensity about them. Medical doctors do not know the cause of MS. However, my experience is that mercury and copper toxicity are always involved. Also, an infection that affects the thyroid and maybe the nervous system may be involved. Iron toxicity may also be involved in some cases. Copper is required to form the myelin sheath on the nerves. In MS, this sheath is not maintained correctly, and this is the cause of the symptoms. When copper is toxic in the body, it builds up in an unusable form. An infection may also affect the myelin sheath as well. An infection would explain why the disease flares up at times, and then goes into remission, at other times. If the cause were purely toxic metals, this would not likely occur, as these do not come and go so easily. Other possible contributing causes in some cases may be other toxic metals such as manganese, aluminum, nickel or perhaps aluminum toxicity. Any of these can accumulate in the brain and affect delicate structures in the brain and other parts of the central nervous system. In a few cases, gluten sensitivity and vitamin D deficiency may play a role, according to some researchers. Going off all gluten-containing foods is often very helpful, for example. Some MS clients are also very sensitive to casein and dairy products, and feel much better off them all, even raw dairy products. Over the past 30 years, I have worked with a number of MS cases using nutritional balancing science. My experience is that early cases respond excellently to nutritional balancing methods of correction. Longstanding cases in which a person is in a wheelchair, for example, may not do as well, probably because the vitality of the body is lower and so there is less energy with which to respond to the nutritional balancing program. Depression with MS. Some people with MS become very depressed and just want to die. This, of course, also slows or can stop their progress on a nutritional balancing program. Remove all silver amalgam dental fillings as soon as possible. This is a very important step. Be sure to stop eating all wheat products, and all sugars in the diet, as these, in particular are very irritating to the intestinal tract and other parts of the body, even if a person has no symptoms whatsoever. Drink at least 3 quarts of spring water daily. Some MS patients are dehydrated. Do not drink with meals, however. Do the Pushing Down Exercise. This is part of every nutritional balancing program, but a lot of people skip it. It is extremely calming and helpful for the nervous system. Near infrared light saunas are quite helpful. If one has difficulty handling the heat of the sauna, then just shine a red heat lamp on the abdomen and/or back for an hour a day..
Go to bed by 9 PM each night. This is helpful to avoid stimulating the sympathetic nervous system. 2) A relentless type of mental efforting. This quality is seen with many, though not all MS patients. This particular type of mental drive may be associated with greater intelligence mixed with a strong will, and a desire to overcome situations using the will. This trait unfortunately causes this illness to be more difficult to heal since excessive sympathetic nervous system activity severely impairs healing. If, however, a person who has MS learns about the qualities of sympathetic dominance pattern, this may assist a process of letting go mentally that is often extremely helpful in these cases to relax the nervous system and allow full healing to occur. 3) Thyroid problems. This is also common in patients with MS.
4) Heat sensitivity. Those with MS usually do not do well in the heat. It tends to weaken them. This may occur because being in the heat tends to turn off the sympathetic nervous system. This will make those with sympathetic dominance very tired, although it is really a good thing for them. 5) Feel worse if they go to bed early. This, also, tends to rest the sympathetic nervous system, which those in sympathetic dominance do not like. They are used to being “keyed up” and feel very tired without the “whip” the sympathetic nervous system provides. 4) Food sensitivities. Sympathetic dominance reduces the nerve energy going to the digestive organs. This may cause or predispose one to a leaky gut condition and/or food sensitivities. 5) Craving for wheat or other slightly stimulating foods. This will tend to keep the sympathetic nervous system active, but is not good for overall health. Eliminating wheat may cause one to feel very tired, although this can be beneficial. What to do. Do what is recommended, such as the Pushing Down Exercise, slow down, rest more, relax more, think more positively, and the other suggestions listed. Try to understand the pattern of sympathetic dominance in yourself, if you think it describes you. To get on the best program, we only recommend the practitioners listed on this website on the How To Begin A Program page. I earned and completed my certification in holistic nutrition and in Functional Diagnostic Nutrition and I am now practicing Hair Mineral Analysis and Nutritional Balancing Science to people all over the globe from my home in Vancouver, British Columbia.